I can hardly believe that a week has gone by since my last letter post. And I don’t have much to show for it, at least much to show of my recent handiwork in the garden. However, the garden is moving along quite nicely and quite quickly without me standing there hovering over it, especially the weeds. Out in the vegetable garden, the peas and spinach are growing well, and the lettuce, radishes and onions are not too far behind. We had some nice rain last week, which combined with the warm days has made those seeds nearly jump out of the ground with their first leaves. However, even though we have had some warm days, we also have had some cool days, too, with frost on the ground on a couple of mornings late in the week. That’s why I always tell people not to get too excited in April. We still have a lot of frost between now and mid-May. 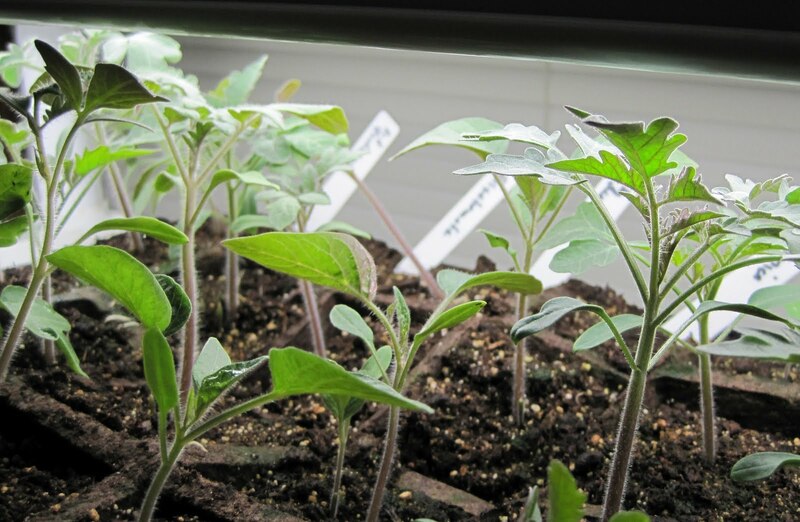 Inside, my tomato plants are doing well, pictured above. As I sit here in the quiet writing this letter, I think that I can almost smell them. You know that good tomato-y smell? That’s the smell of summer to me. One piece of exciting news, at least to me… this past week, I signed off on the design for the “neighbor’s view” garden, which is the front yard. “Let the digging begin”, and I think it will in another week or so. In the meantime, there are some smaller plants in the front garden, and also in the back where I hope to expand the patio, that I need to move to new locations. I’ve been mulling over some of the logistics of those plant moves and need to just find time to start moving them. More on that later. Elsewhere in the garden, it seems there are new blooms nearly every day. One of them is this double-flowered bloodroot, Sanguinaria canadensis, sent to me by Kathy of Cold Climate Gardening. It's a stunning little wildflower but probably won't be blooming for Garden Bloggers’ Bloom Day on the 15th so I thought I'd post a special picture of it today. Anyway... I hope you both had good weeks last week and have a good time this week in the garden! 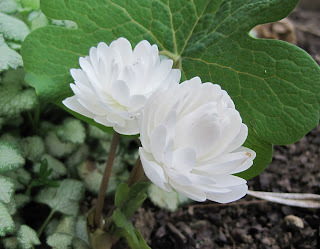 Hi Carol - the bloodroot is gorgeous. It's a shame that the flowers are shortlived. Can't wait to see what you do post for the 15th - you always have such great blooms. That bloodroot is incredible. I didn't know there was a double variety. Absolutely stunning! Great news on finalizing plans for the neighbor's view garden. You're so thoughtful of your neighbors! I want some bloodroot if it's always that lovely. "Neighbor's view" is a good name for the front garden. Makes me wish I lived across the street from you. My view isn't very inspiring. This is really interesting take on the concept. I never thought of it that way. I came across this site recently which I think will be of great use http://www.climatedoctors.com/ . Have a look! LOVE the bloodroot! Its one of my favourite native wildflowers. That double is spectacular!